Looking for a better-for-you dessert? 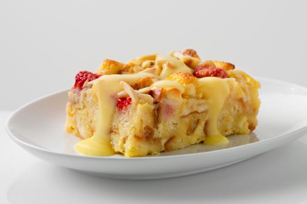 This pudding with whole grain bread, raspberries and white chocolate fits that bill—deliciously! Toss bread with margarine; spread onto bottom of 13x9-inch baking dish sprayed with cooking spray. Sprinkle with raspberries and chocolate morsels. Beat pudding mixes and milk in large bowl with whisk 2 min. Reserve 1-1/2 cups pudding; refrigerate until ready to use. Whisk egg product into remaining pudding until blended; pour over ingredients in baking dish. Substitute frozen blueberries for the raspberries. Refrigerate any leftover pudding. Reheat in microwave just before serving, if desired.